Useful accessory for the leather edge paint quick manual application. Allow a quick and precise application of the edge paint, the knurled roller reproducing the application characteristic of an automatic machine. Very easy to clean. The roller dye tool is completely builded in alluminium with CAD/CAM process. It is composed by a knurled roller and a basic support that can be easily filled by the edge paint. 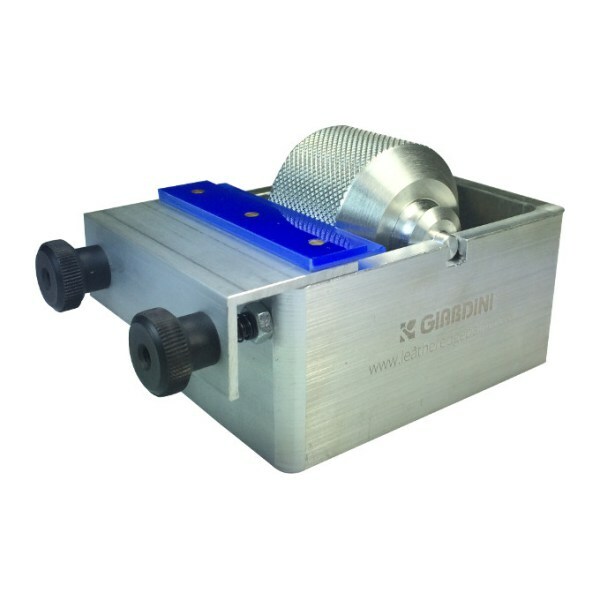 The knurling on the roller perfectly simulated the machine application of the paint, and the quantity of the paint can be ajusted by the two screw regulators. Once you finished to apply the paint the knurled roller can be removed from the basic support and both can be easily cleaned using fresh water. The aluminum alloy avoids any type of oxidation of the tool increasing its lifetime. In case that you forget to clean the tool and paint dried on the knurled roller, we advice to soak the part in a water/alcohol solution (50% + 50%) for several hours before proceeding with the removal of the dried paint by a brush.